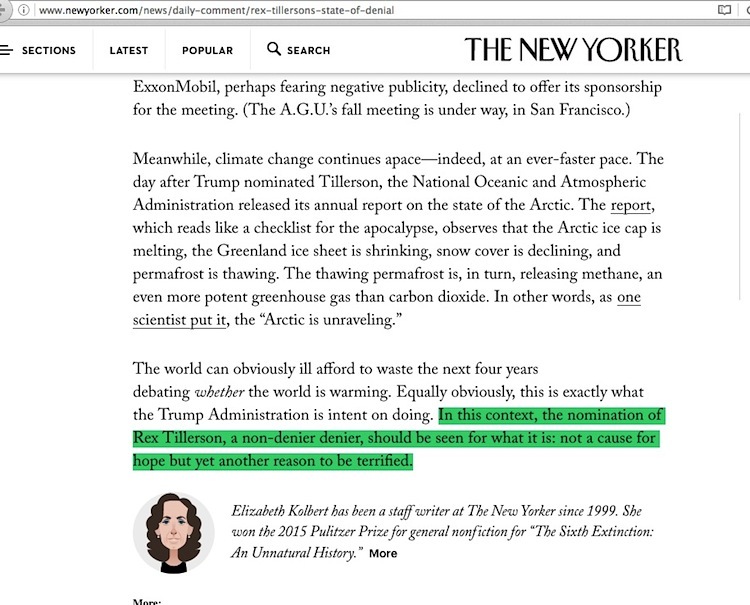 Spend even the briefest effort doing a combined internet search of the words “Exxon” and “climate change”, and it becomes abundantly obvious that enviro-activists have long believed Exxon is a fundamental threat to the planet (full archived text here), and now that Exxon’s CEO – who supposedly has overseen a climate denial machine (full text here) over the last decade – has been tapped by President-elect Trump to be Secretary of State, we should be terrified of him. 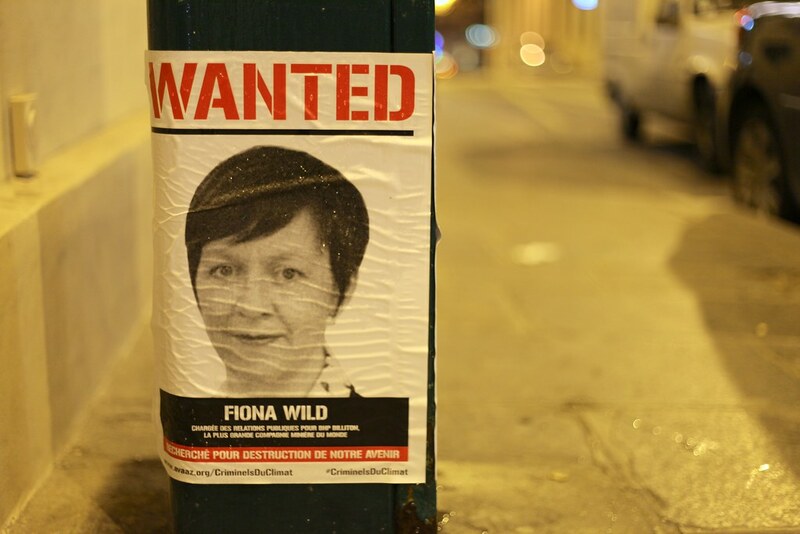 But just a under two months ago, a situation arose which may indicate that this giant Rex-Exxon survival problem facing the planet could instead be a massive survival problem for enviro-activists. Various entities have been losing the global warming issue war for many years, succumbing to enviro-activist pressure to offer, at minimum, some kind of politically correct capitulation about how human activity is responsible for the warming. Exxon is among those offering such a position. Having achieved this victory, you’d think enviro-activists would wisely quit when they are ahead. In some cases, putting even more pressure on an already politically correct major corporate entity seems to bring no harm to enviro-activists. 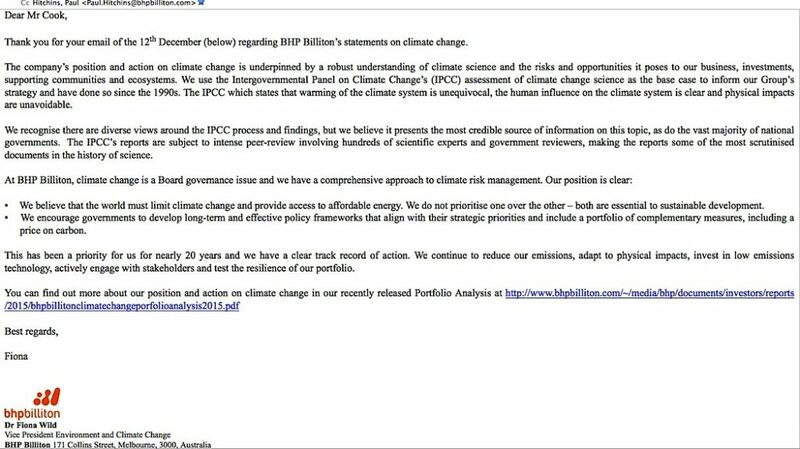 Witness how BHP Billiton had an obviously pro-global warming position prior to the 2015 Paris Climate Accord conference, yet enviro-activists called one of BHP’s conference attendees a corporate criminal. When I wrote straight to the ‘criminal’ to point out that BHP’s political correctness would do nothing to stifle attacks against the company, she replied with what is arguably an even more politically correct position. However, that particular accusation has apparently gone one step too far, in the form of the latest heavier enviro-activist pressure aimed straight at Exxon via a set of exposé articles from Inside Climate News insinuating “Exxon Knew” that its product caused dangerous global warming and covered up this knowledge. Those articles prompted New York State Attorney General Eric Schneiderman to launch an inquiry into whether Exxon engaged in racketeering when it allegedly hid self-incriminating information from its shareholders and the public, just like the old tobacco industry did about the harm of cigarette smoking hazards. 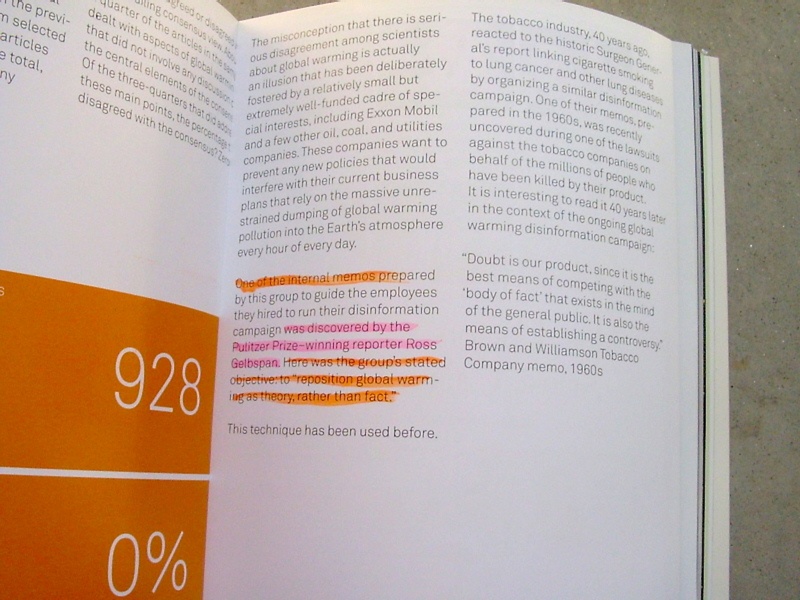 Where enviro-activists went too far was their belief that Exxon would surrender to the same sort of legal settlements that the tobacco industry faced. 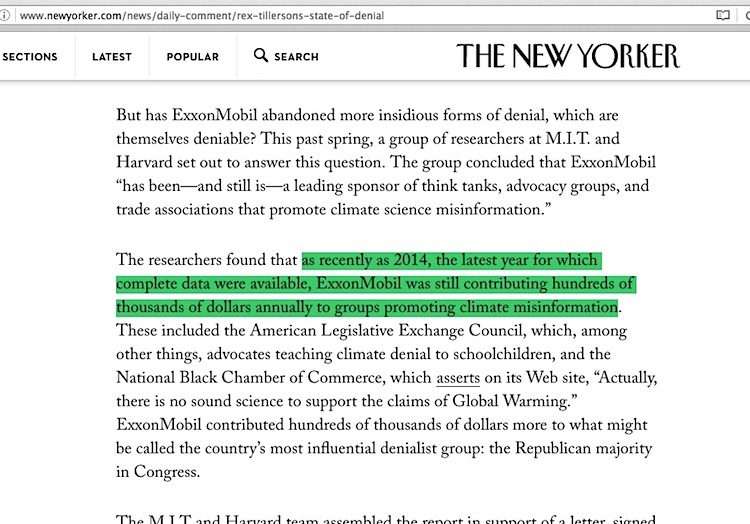 This November 3rd Washington Post article headline, “ExxonMobil tells independent groups to preserve records”, and in the details within the article indicates otherwise. 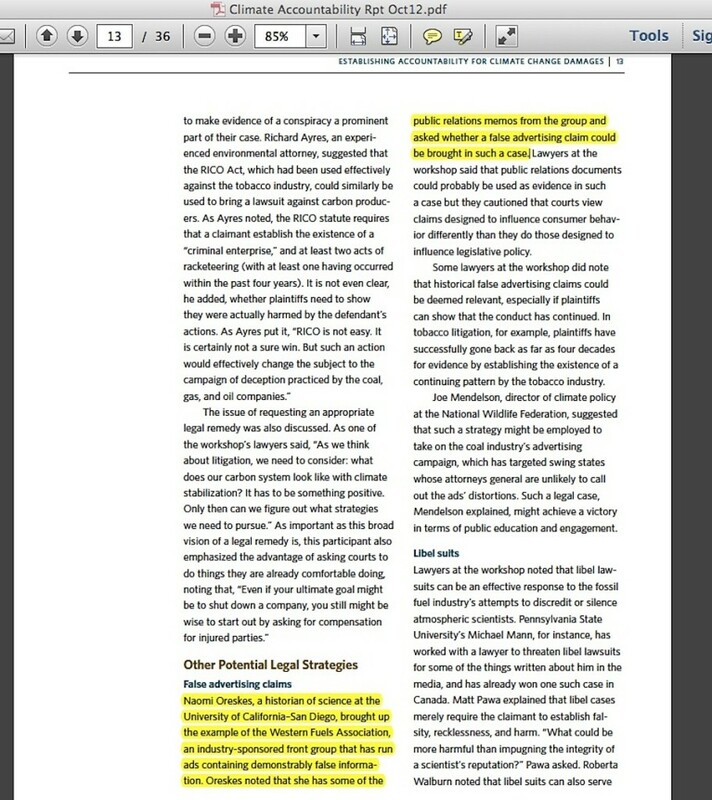 In an effort to send the company further down the path of discovery about who really seems to be doing the racketeering in this issue, I sent the information below verbatim (with non-embedded links) as an email to Exxon via its online contact form and straight to the lawyer group noted in the article. No response yet. But with this blog post, I’ve made the additional effort to alert them about this monstrous problem, and I do have influential friends who might read this as well. The problem is not disinformation and racketeering exposed by pure-minded enviro-activists; a legal action by Exxon may reveal the situation to be exactly the opposite. 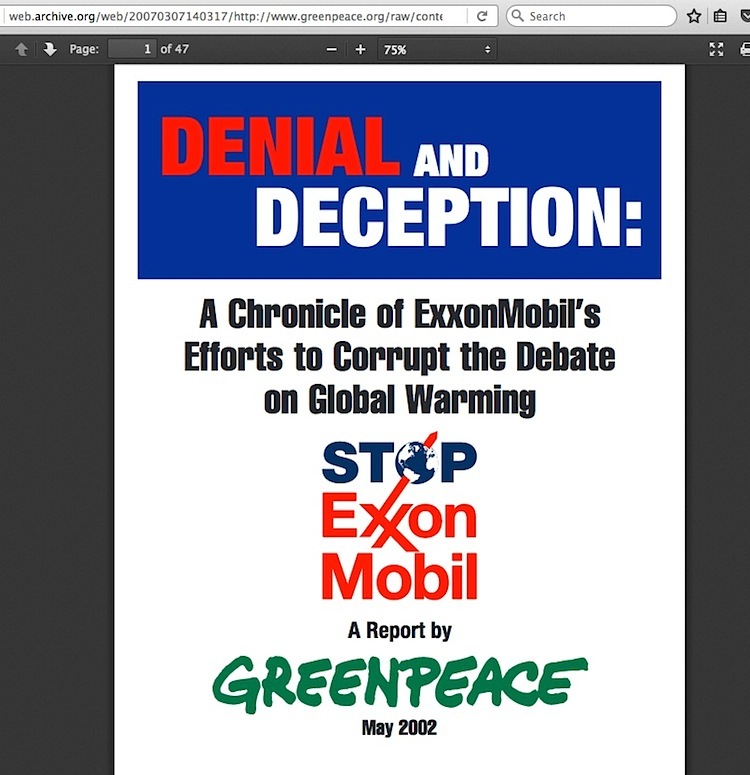 Regarding the 11/3/16 Washington Post article ( https://www.washingtonpost.com/news/energy-environment/wp/2016/11/03/exxonmobil-tells-independent-groups-to-preserve-records-of-their-climate-case-communications-including-with-the-press/ ), it mentions right away that Exxon’s lawyers Paul Weiss Rifkind Wharton & Garrison ‘letters of preservation’ included one to the Union of Concerned Scientists. In brief, allow me to illustrate how I suggest that your preservation letter effort – if it has not already – be extended to include Greenpeace, particular former members of Greenpeace USA, Al Gore, and global warming alarmist book authors Naomi Oreskes and Ross Gelbspan (note: I have sent a basically identical email alert to Exxon via their generic online contact form). 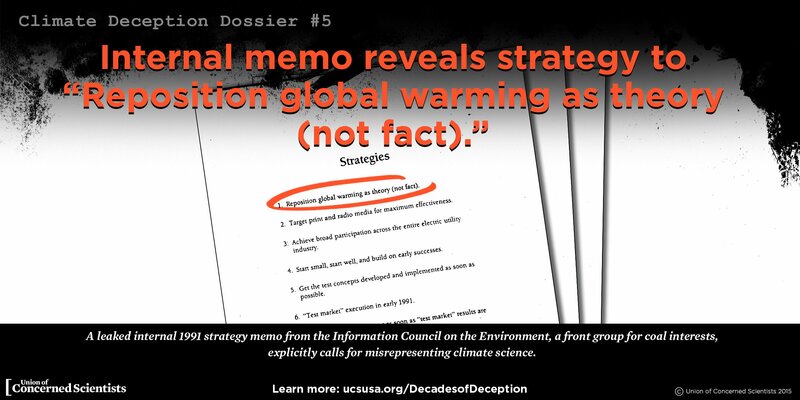 1) Please consider how UCS put out a set of dossiers in 2015 which attempted to portray skeptic climate scientists as ‘industry-corrupted shills of the fossil fuel industry’. 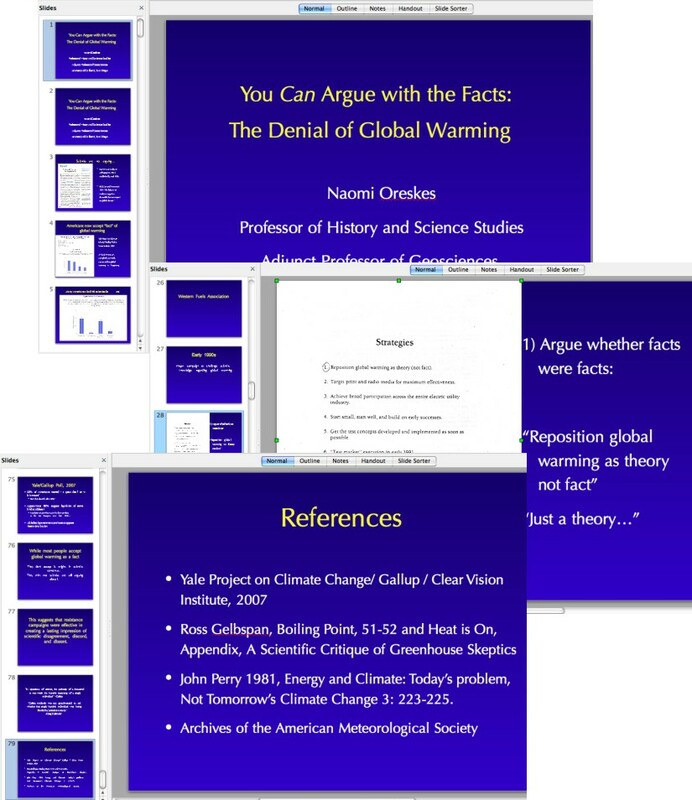 On[e] sic of those in particular trumpeted a supposedly leaked industry memo which prominently proclaimed that such skeptics had been directed to “reposition global warming as theory rather than fact” ( http://www.ucsusa.org/sites/default/files/images/2015/07/gw-minigraphic-climate-deception-dossier-5-ICE-memo.jpg ). In my July 9, 2015 blog post ( http://gelbspanfiles.com/?p=2891 ) I detailed how UCS was not immediately forthcoming about saying that their ‘new’ revelation was actually a very old one sourced from Greenpeace archives. 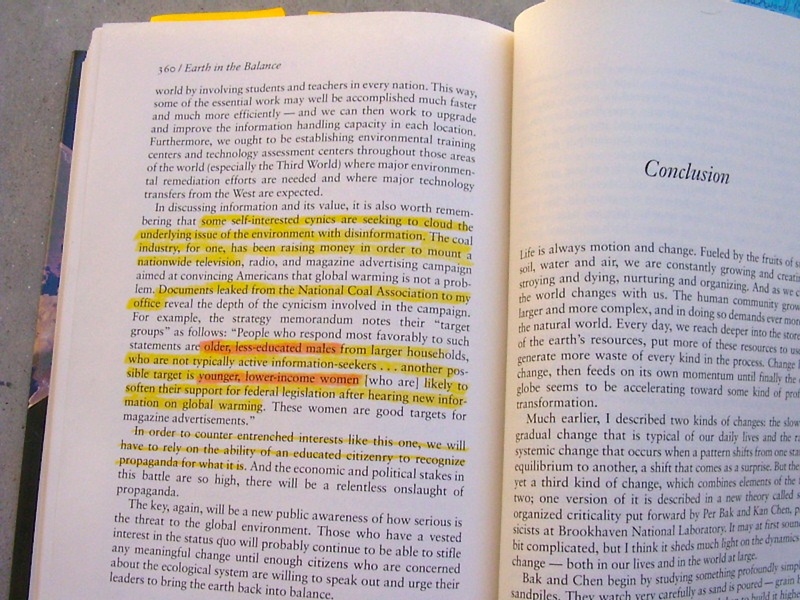 5) Gelbspan’s most famous quoting of that phrase and the directly related “older, less-educated men” / “young, low-income women” leaked industry phrases’ appeared in his 1997 “The Heat is Online” book http://gelbspanfiles.com/wp-content/uploads/2015/03/THio-pg-34.jpg ….. noting that they came from a COAL industry PR campaign. Again, if I may suggest it, please widen your documents retention request to include any information surrounding the Western Fuels Association’s 1991 “Information Council for the Environment” (often mistakenly called the “Information Council ON the Environment”) campaign that Gore, Oreskes and Gelbspan may have retained, including any correspondence they may have also sent out about it. 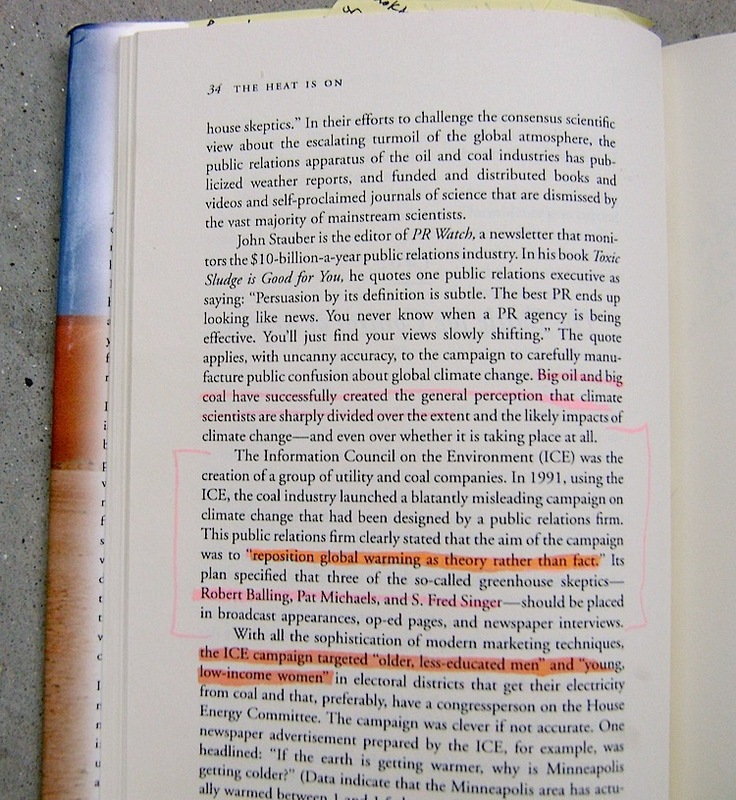 I say the WFA ICE campaign ‘leaked memos’ are the core evidence in enviro-activists 20 year+ accusation that skeptic climate scientists are industry crooks ( http://gelbspanfiles.com/?p=4438 ), thus the need to find all documents relating to the longterm effort to push that false accusation. 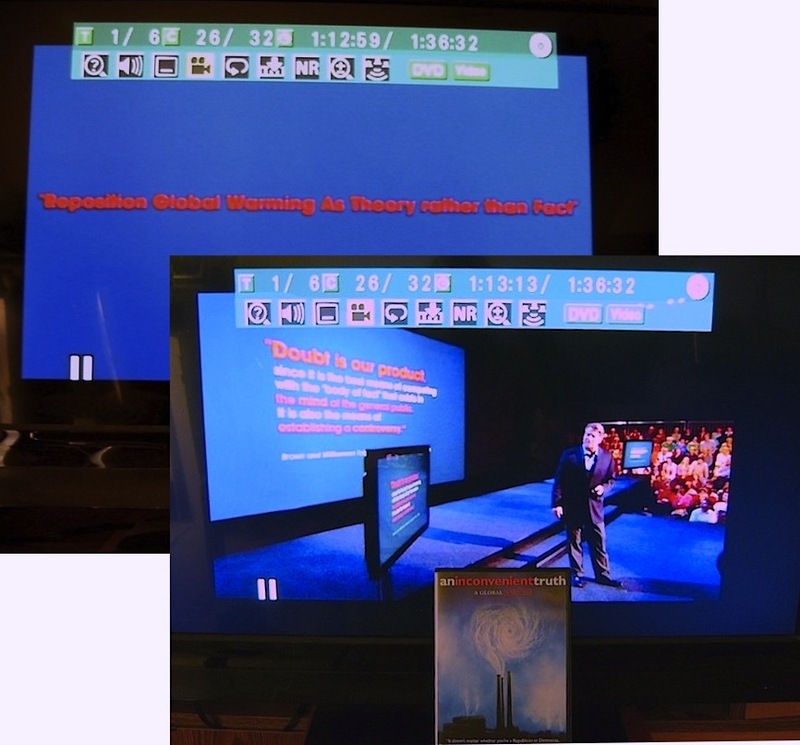 This entry was posted in Character assassination and tagged Al Gore, Exxon, Naomi Oreskes, Union of Concerned Scientists by Russell Cook. Bookmark the permalink.